Please include the names or custom lettering you would like on each hanger. Personalized hangers make for beautiful keepsakes for weddings or other special events. Each hanger is finely handlettered using white ink onto a natural or cherry wooden hanger. 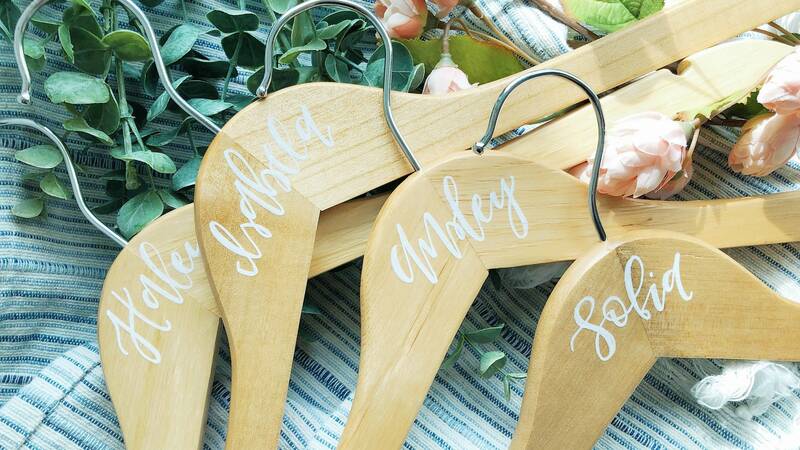 + Each hanger features white script lettering onto a natural wooden hanger. + Please select the quantity of hangers you'd like to purchase from the dropdown menu. + In the "notes" section at checkout please indicate the custom lettering you'd like. Bride | Bridesmaid | Maid/Matron of Honor | Mother of the Bride, etc. Please make sure to include the words you want written on each hanger in the "notes" section when you place your order. Please double check your spelling before submitting the information because I will copy exactly what you send. I am not responsible for misspelled words submitted by the buyer. + All orders are made to order so please allow 1-2 days for lettering. I aim to ship my orders the following day! Expedited shipping can be requested at checkout. + For weddings or other major events, I recommend placing your order about a week before your scheduled event. If you have any questions about turnaround time, don't hesitate to contact me! Due to the custom nature of this order I will not accept exchanges or returns, but please contact me if you experience any issues.